In some of my previous posts, I have mentioned that in the Fall I like to troll the lowland lakes for trout. This always raises a few eyebrows, but trolling lowland lakes for trout can be very productive this time of year. If you are going to get out on the water and try and bring home some trout, here are my Top 5 Trout Lures when trolling lowland lakes. Most of the lowland lakes are pretty stained, so fish have to rely on smell or vibration to find your lure. Wide spoons create more ‘thump’ in the water and can pull fish from a longer distance, and can be trolled extra slow. 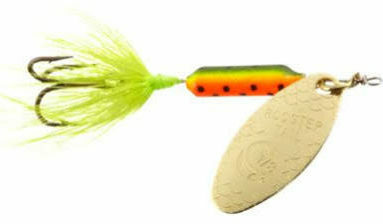 Always a go-to lure, Rooster Tail spinners can sometimes produce when other lures are not pulling strikes. Colors for me are white or black with at least a little red. Again, the stained water you are fishing is going to limit the colors the fish can see until the last second, so contrasts are important! 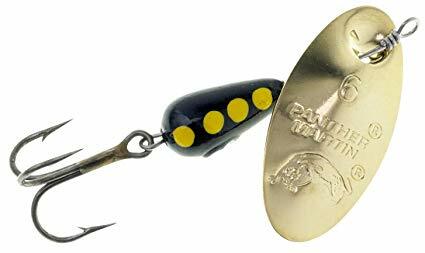 I know it is probably redundant to go with a spinner again in the #3 spot for favorite trout lures, but Panther Martin lures produce. My guess is that the French style spinner gives a slightly different vibration that those trout love. This is Thomas’ go to lure when we are on lakes. Typically we stick with green or red and don’t need to get fancy. A wedding ring with some worm on the hook may not knock the fish out of the park, but will almost always produce at least a few fish. I highly suggest having a selection for 5-6 different colors in your tackle box as one color may work today and another will work tomorrow. Always keep testing until you find the color they are keying on. This is absolutely my #1, to tie on when I hit the water early in the morning. I tie on a small FireTiger Pattern Rapala using a jig loop knot as we are pulling away from the launch. It is quick and easy to get in the water, and in the early morning light, it almost always pick up one or two trout on it immediately. There are my top 5 choices for trout lures when I am trolling lowland lakes. I would love to get your input on what your favorite lures are. Disagree with me on the best lures to be using when you are trolling for trout? Post your top 5 trout lures in the comments!